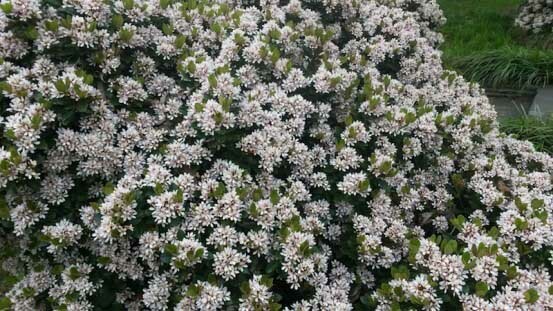 Are your once lush, flowering and full Indian hawthorn shrubs now looking lackluster with bare branches? With all the rainy weather we’ve had in Dallas, fungal diseases such as entomosporium leaf spot are flaring up with force. Entomosporium leaf spot, Entomosporium maculatum, is a fungal leaf spot disease. It’s a common problem on rose relatives like red tip photinia, quince, pear and Indian hawthorn. Once foliage is infected with the fungus it eventually dies and drops from the plant. This Indian hawthorn has lost almost all its foliage to leaf spot. Entomosporium leaf spot thrives in hot, humid conditions. The heavy spring rains and heat have created the perfect conditions for the disease to thrive. The fungal spores are spread from leaf to leaf through water droplets. Leaf spot is also a problem on Indian hawthorns that receive too much shade and/or overhead watering on the foliage. Entomosporium maculatum produces tiny red spots on plant leaves that will sometimes have a yellow ring around the edges. Over time, the spots get darker and enlarge, covering the entire leaf. Unfortunately, many Indian hawthorn succumb to leaf spot because they are in the wrong environment. 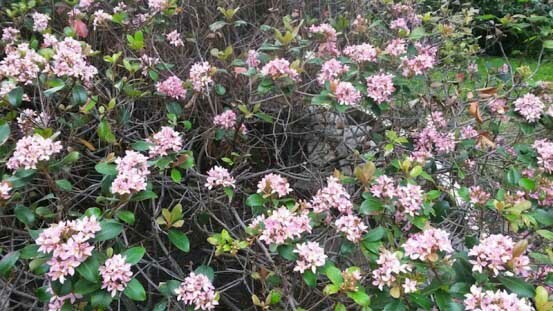 Indian hawthorn shrubs need a full sun location in order to thrive and bloom well. When plants receive too much shade, combined with over-watering, they’re prone to fungal diseases. Stay up-to-date on what is happening in your landscape each season. Visit our Pest and Disease ID Guide here, then feel free to ask questions about your plants on Facebook and Twitter.